A new standard has been reached! Do not be fooled by the low price, the quality of this deck is by far the best available from the USPC. The cards are printed on the card stock used for Bee decks and with Q1 quality. The intent of the producer is to give maximum distribution to this deck by keeping the price very low so that it becomes a worthy substitute for standard decks such as the Bicycle, Phoenix, etc. Steel Playing Cards have been embraced by countless fans, due to their premium design and finest quality. 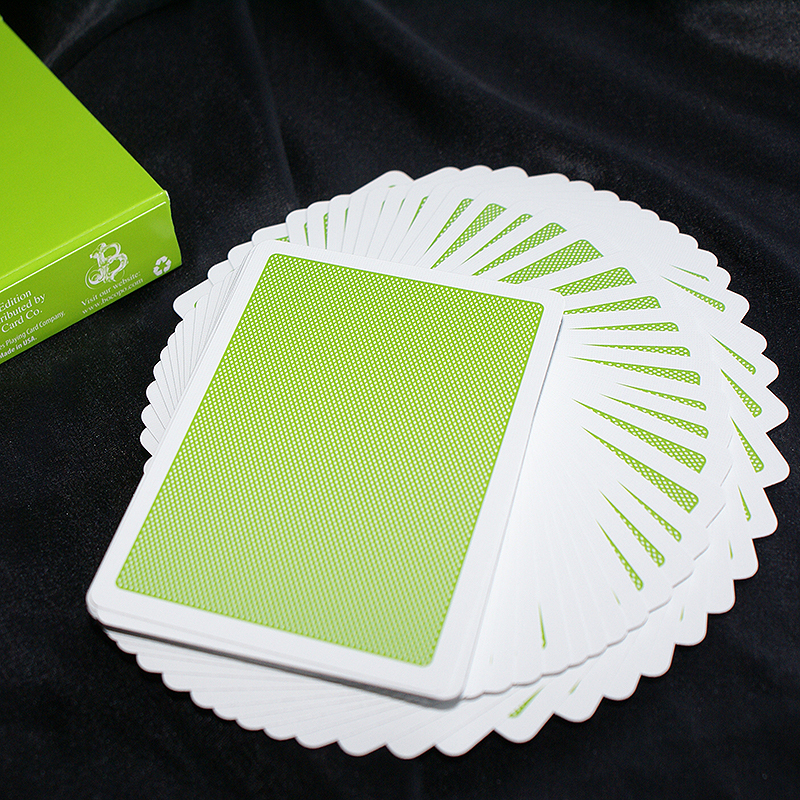 The bright-colored card back echoes the color on the tuck. Simple dot patterns coupled with a white edge make these decks graceful and luxurious. Classic Patterns are adopted on the card face to enhance the entirely solid-color design style. Custom Joker cards have the Bocopo Playing Card Company's logo. The flawless design makes the deck a fabulous selection for magicians and cardists alike. Steel Playing Cards are printed by the United States Playing Card Company with casino quality stock. Air-Cushion Finish enhances the cards' amazing handing. These wonderful decks will bring you immediate pleasure as soon as they come out of their tuck. • The cards are poker size. Steel Playing Cards have been embraced by countless fans, due to their premium design and finest quality. The bright-colored card back echoes the color on the tuck. Simple dot patterns coupled with a white edge make these decks graceful and luxurious. Classic Patterns are adopted on the card face to enhance the entirely solid-color design style. Custom Joker cards have the Bocopo Playing Card Company's logo. The flawless design makes the deck a fabulous selection for magicians and cardists alike. Steel Playing Cards are printed by the United States Playing Card Company with casino quality stock. Air-Cushion Finish enhances the cards' amazing handing. These wonderful decks will bring you immediate pleasure as soon as they come out of their tuck. • The cards are poker size.